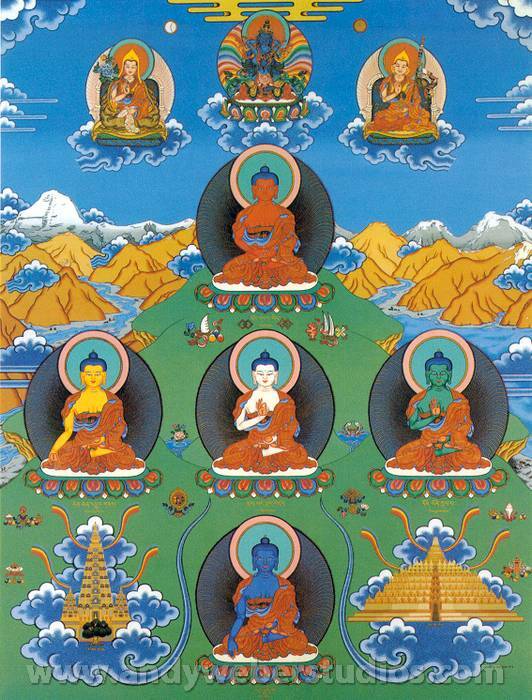 The five Dhyani Buddhas represent the basic mandala in ourselves, our environment and in the cosmos. Most deities belong to one of these five buddha families. Through their tantric practices negative energies and attitudes are transformed into enlightened wisdoms. The white father Vairocana transforms anger, the blue Akshobya transforms ignorance and stupidity. The yellow Ratnasambhava transforms pride , the green father Amoghasiddhi jealousy and the red father Amitabha transforms passion. In the top centre sits Vairocana, flanked by Gedun Dukpa, the first Dalai Lama and his disciple Panchen Zangpo Tashi on his left side (right). In the bottom corner are the two great stupas, on the left Bodhgaya (India) and on the right Borobudur (Indonesia).